(Host) A hydrologist hired by opponents of a wind project in the Green Mountain National Forest says the installation could increase the danger of flooding. VPR’s Susan Keese has the story. (Keese) Andres Torizzo of Watershed Consulting Associates, told officials in Wilmington that their town – which saw heavy damage in Irene – is a likely target for storm runoff from Deerfield Wind. The 15-turbine project has a Certificate of Public Good from the state Public Service Board, and recently won approval from the U.S. Forest Service. Torizzo is working for Vermonters for a Clean Environment. The group plans to appeal the national forest decision. In a presentation in Wilmington, Torizzo claimed the Deerfield project’s developer underestimated storm water runoff at the site, once the trees are removed and more bedrock is exposed. (Torizzo) "Our concerns are that, first during the construction phase of the project, there’ll be too much land open at any one time and it will be too difficult to properly protect against erosion in advance of a storm event… And then we do feel that there are issues with the design and the assumptions in the modeling analysis that was done to design the storm water system on the site." (Keese) Torizzo said Deerfield Wind’s plan is based on incorrect assumptions, that gravel roads required to build and maintain the turbines will absorb water. He said the state considers gravel roads impervious. He also claimed the site is too steep for the devices the developer plans to use to spread runoff water out, instead of letting it form channels that can cause erosion and storm damage. Paul Copleman is with Iberdrola Renewables, the company behind the Deerfield project. He says the company’s water management plan is currently under state review. (Copleman) "We have nearly 50 wind projects in operation from coast to coast, so this is an issue we have a lot of experience with, and we always strive to exceed state guidelines. And we performed a storm water design analysis with Vermont state-licensed professional engineers in accordance with state requirements." (Keese) Torizzo, the hydrologist, had similar objections to the wind project in Lowell, which is under construction. He predicts that project will be a test of differing assumptions about the consequences of large-scale ridge-top development. 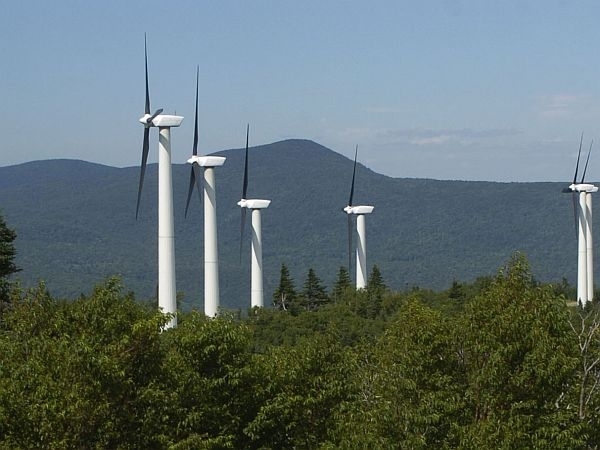 The Green Mountain Club has withdrawn an appeal of the Deerfield Wind project. A 15-turbine wind project just approved by the Green Mountain National Forest could set a precedent as the nation’s first commercial wind farm on national forest land. But opponents say the Deerfield Wind project will be appealed.